Lake Constance is probably the most popular and beautiful lake in Germany. Constance is actually the French name of the lake, and locally it is known by the name Constance, but is also called the "Swabian Sea". It was formed along the Rhine, and bordered by Germany, Switzerland and Austria. An interesting fact is that among these countries there is no common agreement where exactly the borders lay inside Constance. On the Swiss side it suggests that dividing line runs down the middle of Constance. Austria determined the lake as a common possession, but the position of Germany itself is still unclear. Lake Constance is one of the largest in Germany and in the scale of Europe, it ranks in third position immediately after Lake Balaton and Lake Geneva. The total area of Constance amounts to 536 square kilometers, the deepest spot reaches 254 meters. The average depth of Constance However, is measured at 90 meters. The German coast of Constance estimated at 173 km for the Swiss remain 72 meters, and Austria about 28 kilometers from the coastal line of Constance. 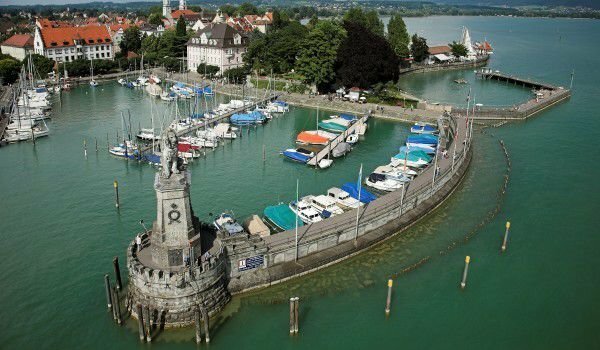 In Lake Constance many islands have formed, but largest and most famous remain - Reichenau, Mainau and Lindau. Lands around this basin are extremely fertile and for centuries have been known as good wine regions. Among the attractions of the Lake Constance (Except sailing boats) are several historical landmarks such as monastery of Reichenau, which is listed as a UNESCO World Heritage Site. We cannot miss the medieval old town on the island of Lindau. Today Constance is a popular tourist destination because of the many options for recreation and sport. The islands offer many opportunities for bicycle tours and even sailing yachts. In the northern part of the lake good conditions for diving and underwater sports prevail. Against 11 euros visitors can go to Maynau island, which lies inside Constance. It is privately owned and its owners in turn have decided to turn it into a paradise of flowers. Known as the Flower Island, Maynau in Constance is a real paradise of sorts, with colorful plants and flowers, around which countless butterflies circle. The very idea of a park with exotic species belongs to Duke Frederick I, who was a passionate traveler and devoted himself to the cause of collecting rare species, then take them to the island. After his death the island declined, and later passed into the possession of the Swedish royal court. In 1932 Maynau is presented as a wedding gift of Count Lennart Bernadotte by his father Prince William. Count Bernadotte was the man who turned the island into the colorful beauty that we see today. After his death at 95 years his wife, Countess Sonja Bernadotte continues the work of her husband quite successfully. The greatest site in in Maynau, Constance, is the Butterfly House where you can see orchids, mimosas and all sorts of other rare species that enchant with their scent. In the Italian garden of roses, there are over 20, 000 roses, selected from over 1200 varieties. Annually on this island in Constance over 1 million visitors come. Among the curious facts about Lake Constance is that over it, for the first time, the father of the Zeppelin - German Count Ferdinand von Zeppelin launched his invention at the beginning of last century. The Zeppelin staggers on July 2, 1900 in front of 12, 000 curious spectators in the town of Friedrichshafen. The flight lasts 18 minutes, after which the aircraft was forced to land in the waters of Lake Constance.